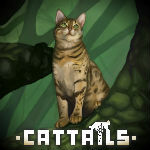 Hello from a nerd named Nat | Cattails: Become a Cat! Oh my gosh! I think I just bought it yesterday, too! Or maybe the day before. I can't remember. I'd been eyeing it for a while. Man, it's super addicting!